UC's new Transfer Pathways simplify course selection at the community college level for students who plan to transfer to UC. 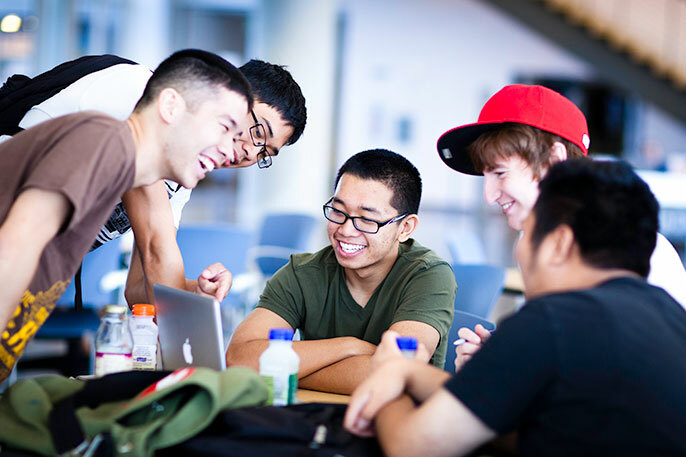 California Community College students seeking to earn a UC degree in 10 popular majors, from economics to cell biology, now will have a clear academic roadmap to prepare for admission at any UC campus and be well-positioned to graduate within two years. University of California officials on July 7 unveiled Transfer Pathways, which provide a single set of courses students can take to prepare for admission in a given major across any of UC’s nine undergraduate campuses. UC President Janet Napolitano announced the pathways, created by UC faculty, at a press conference at Sacramento City College’s Davis Center, the first community college facility housed on a UC campus. She was joined at the event by UC and community college leaders, elected officials and advocates for public higher education. Roughly 30 percent of UC undergraduates begin their education at community college, a rate unmatched by any other top-tier university in the country. The transfer process, however, is one that some students find complex and cumbersome, and could discourage otherwise qualified students from pursuing a UC education. The pathways are a major step toward creating a simple, straightforward process that streamlines transfer to UC from California’s 112 community colleges, Napolitano said. “These pathways don’t represent the end of our work, but they are a significant step in our ongoing efforts,” she said. Students who follow the recommended courses will be well-positioned to apply to any of UC’s nine undergraduate campuses, and to successfully tackle rigorous, upper division coursework once they are enrolled, Napolitano said. Given the competitive nature of admission to UC, counselors and academic advisors recommend students apply to more than one UC campus. But students have encountered differing course requirements among campus for similar majors. The Transfer Pathways provide a single set of courses for each major that meet the requirements at all nine undergraduate campuses. Tammi Driver, a UC Davis graduate who transferred from Sacramento City College and now works as an adviser at the community college, was among those who enthusiastically greeted the news. A first-generation college student who had long set her sights on UC, Driver had hoped to major in math, but ultimately shifted to art in order to graduate in a timely manner. Having an academic roadmap, she said, would have helped her focus her community college coursework so that more of it counted toward her desired degree. “This offers a lot of guidance for getting you right where you want to go,” she said. The new pathways cover coursework for 10 of the most popular majors; another 11 disciplines will be added later this year. Collectively, the first 21 Transfer Pathways cover the majors chosen by two-thirds of students seeking transfer to UC. A new website gives students details for each transfer path, and provides them with other information and resources to help them plan and prepare. Napolitano launched an initiative to improve the transfer process as one of her first acts after assuming leadership of the 10-campus UC system in fall 2013. She created a Transfer Action Team to find ways to better serve transfer students, and met with dozens of community college leaders across the state. Both efforts pointed to the need to create a unified set of recommended courses to prepare students pursuing a given major for admission to multiple UC campuses. “We took what was already underway and we put rocket fuel into it,” Napolitano said. To arrive at the Transfer Pathways, UC campus faculty and academic leaders worked over the past several months to align and streamline requirements that would account for differing focuses and emphases among majors on each campus. “To get all of our UC campuses to agree on what should be required so that students can enter truly prepared to enter the university as juniors and graduate on time involved a lot of moving parts and hard work [by] the faculty and Academic Senate,” Napolitano said. "These pathways will allow us to better meet students' needs by making course expectations more transparent while maintaining high academic standards," said UC Academic Senate chair Mary Gilly. A streamlined system for transfer will draw bright, talented students who might not have otherwise considered UC, said Mitchel Benson, an associate vice chancellor at Los Rios Community College District. “This is a smart way to implement it," he said. The pathways respond not only to students’ needs, but to California workforce demands. The first set of pathways include many disciplines in the sciences, which might encourage more students to pursue those majors — and to pursue a UC education, where they can work alongside the most world-renowned leaders in the field, Benson said.